How to Deploy 48 Port 10GE Switch in Data Center? 10 Gigabit network becomes popular as the business is growing, which enhance the deployment of 10G copper or SFP+ switches in data centers. With the rapid evolvement of IoT (Internet of things), cloud computing and other media-rich applications such as Skype, Amazon video, Snapchat and Youtube, the shift from 10G network to 40G has become the new trend. In this process, 10GbE switch with 40G QSFP+ uplink port makes a difference. In this post, the applications of 48 port 10GE switch for data center design will be explored. 10GE switch provides high-density 10GE access to help enterprises and carriers build a scalable data center network platform in the cloud computing era. 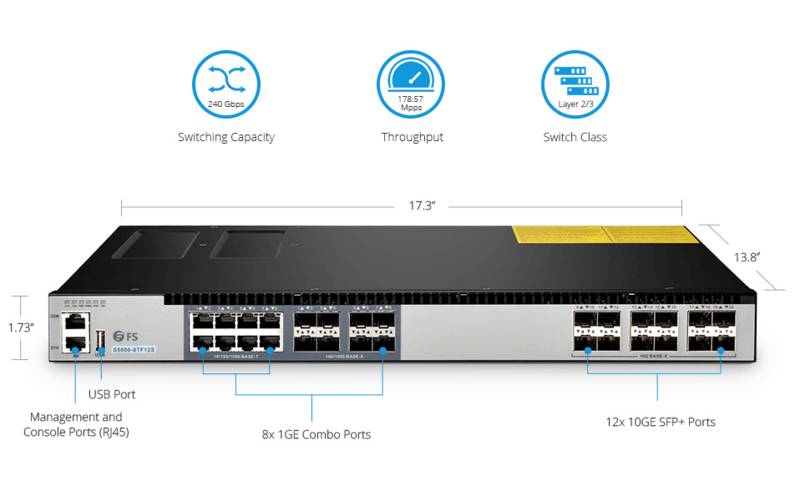 When it comes to 48 port 10GE network switches, Cisco 10GE SFP+ switches maybe the first choice that many users prefer. However, not all network vendors will choose Cisco switches due to their high price. 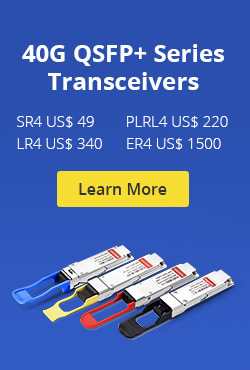 And there are various types of 10 Gigabit switch in the market for network designers to choose from. The table below shows the main details of several 48 port 10GE switches that can be used as ToR or leaf switches in data centers. 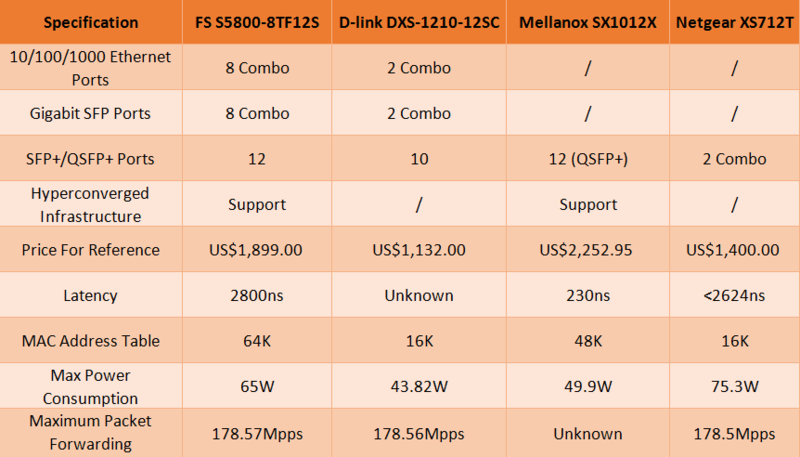 Network designers can take it as a reference when choosing 10GbE SFP switch. 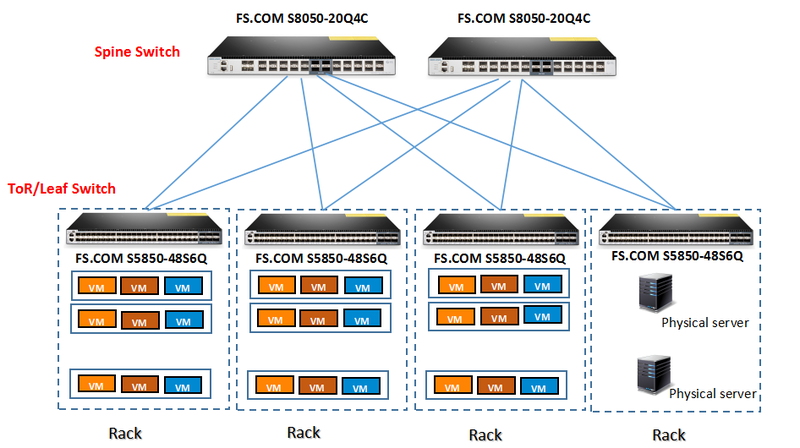 To illustrate how to design the 48 port 10GE switch in practical applications, here take FS.COM S5850-48S6Q ToR/Leaf 10GE switch as an example. 48 port 10GE switches are often used as leaf switches in large data center design. In today’s data center, leaf-spine topology and ToR design are the commonly used architectures. And ToR switches are used as leaf switches and they are connected to the spine switches. Just as the following picture shows, FS.COM S5850-48S6Q 10GE switches work as ToR switches and connected to the spine switches (FS.COM 100G switches) using the 40G/10G port. Of course, 48 port 10GE switch also can act as aggregation or core switches for enterprise campus networks. 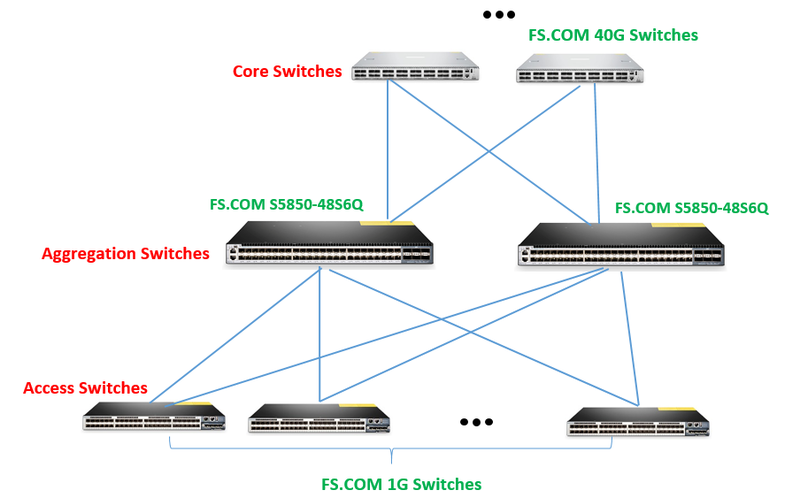 In the following application diagram, FS.COM S5850-48S6Q 10GE switches work as aggregation switches and connected to 40G core switches and gigabit switch. For a spine-leaf network, usually the uplinks from leaf to spine are 10G or 40G, and they can migrate over time from a starting point of 10G (Nx10G) to 40G (or Nx40G). 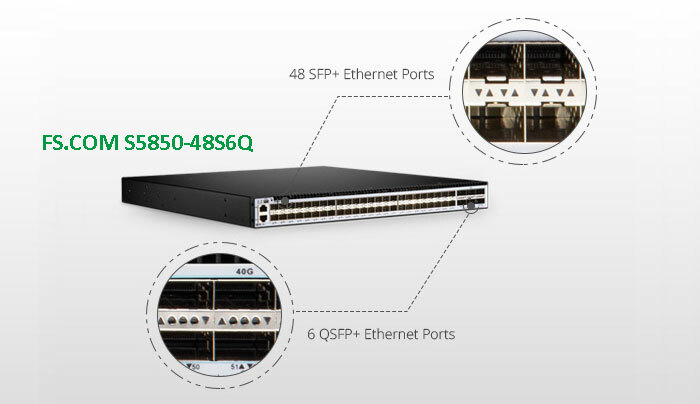 The 48 port 10GE ToR network switch listed above offer this flexibility, because the 40G QSFP+ uplink port can be configured as either 1x40G or 4x10G and using optics breakout to individual 10G links, allowing many designs easily evolve from 10G uplinks to 40G uplinks or support a combination. The next generation data center network will continue to evolve rapidly over the few years. 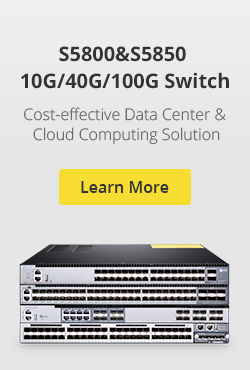 While with both 10G SFP+ port and 40G QSFP+ uplink port, this cheap 10GbE switch provides cost-effective and high-density data center and campus network solutions, and can meet the ever-increasing demand for network bandwidth at the same time. Related article: Can We Use Third-party Optical Transceiver Modules for Dell Switches? This entry was posted in Data Center Switch and tagged 10 gigabit switch, 10gbe sfp switch, 10GbE switch, 10ge switch, 48 Port 10GE Switch on January 5, 2018 by Chloe Wang.